Right now at Mr Porter there are — this is not a joke — no fewer than 1,500 items of apparel and accessories on sale, many of them at 50 percent off. So if you’ve always wanted a high-end blazer, stylish new watch, or a $1,390 pair of shorts (!) at 50 percent off (we’ll let you do the math), now is the time to pull the trigger. All kidding aside, there’s so much to choose from we had a hard time deciding what to highlight for this story. In the end we decided to go for stuff that’s season-appropriate, so you can bust them out as soon as they arrive at your door this summer. After lots of hand-wringing and bean-counting, here are a few items we think are both lust-worthy and priced right. But hurry — size selection is limited and things are selling out fast. The iconic Italian luxury brand Dolce & Gabbana has always managed to combine style and comfort in their designs, but who can afford it? Right now, you can. 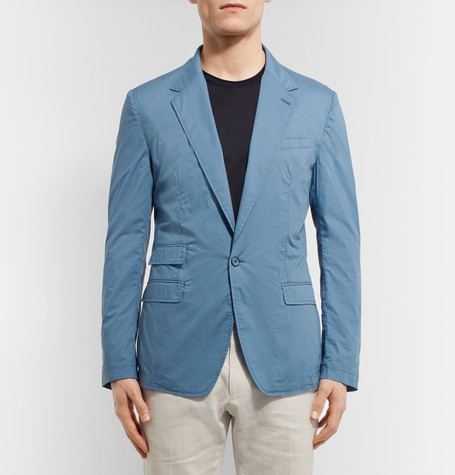 This blue slim-fit cotton blazer is a garment-dyed, casual jacket in striking blue that’s lightweight and partially lined to help preserve the shape. Get it now for half off at $773. Tsovet, the L.A.-based watchmaker founded in 2008, rides the line between the classic and contemporary. Their SVT-RM40 Stainless Steel And Leather Watch (top) is bold in appearance with its all-black stainless steel housing an imported Swiss quartz movement. The face is also in black with a mineral crystal lens-covered dial. It’s also water-resistant to 100 meters. Get it for half off at $198. The Belgian designer Dries Van Noten has been interweaving elegance and the avant garde for more than 30 years. 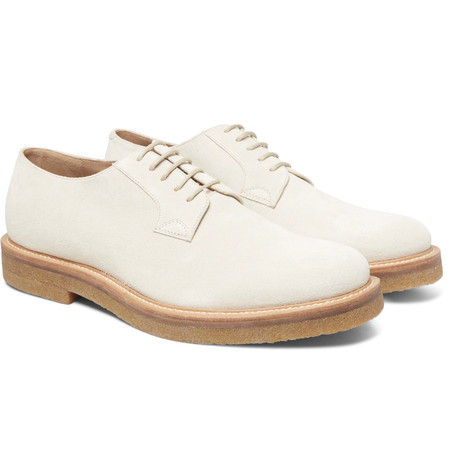 His suede derby shoes manage to take the somewhat staid style and breathe new life into the look. Made of ecru suede with rubber crepe soles, they’re more versatile than you’d think and will get you from the races to a summer wedding to a casual dinner and night on the town and back again. Pick ‘em up for $396 (regularly $660). Anderson’s, the family-run Italian belt and bag company with the British-sounding name, has been around for 50 years and neatly combines fine Italian craftsmanship with an eye toward traditional British style. 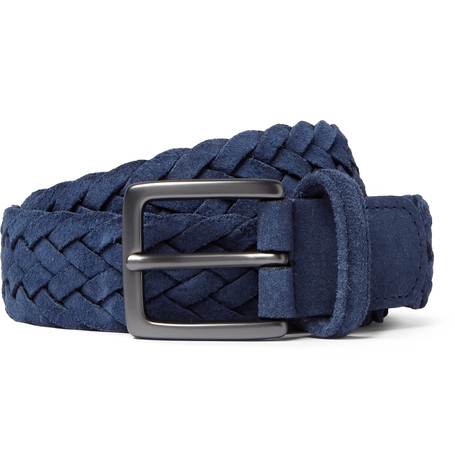 Handmade by Italian artisans this slim and fun Blue Woven Suede Belt is intricately woven and features a gun-metal buckle that will go great with a pair of jeans or chinos this summer. It’s on sale for $130. 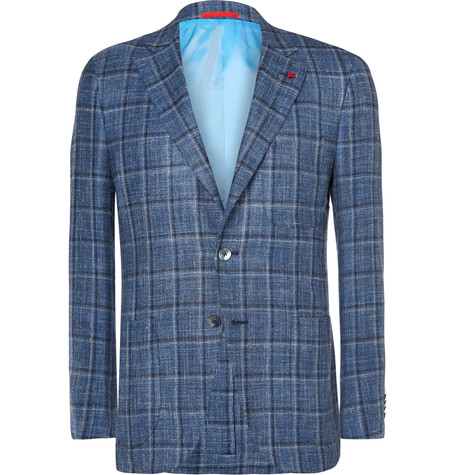 Finally, if you’re looking for something that will get you through more than the summer season, check out Isaia’s slim-fit checked blazer. It’s made from a wool-linen-silk blend in blue, navy, and beige and is cut by hand. This Italian menswear label’s been around for nearly a century, yet still manages to stay relevant. The jacket is also half off at $1,563.